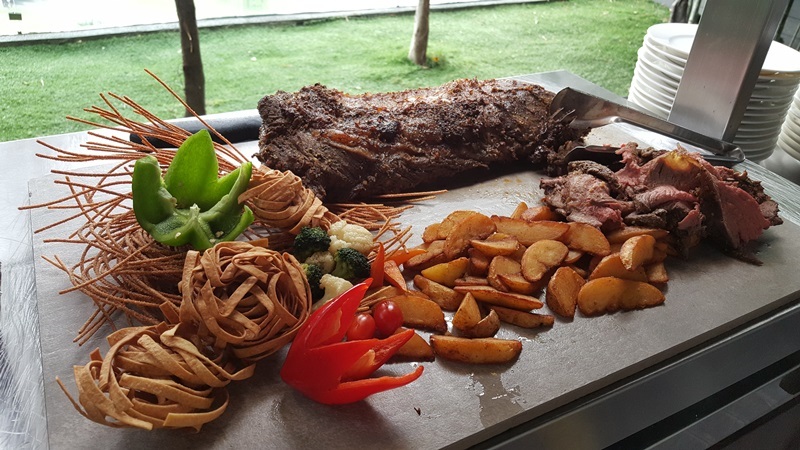 With more than 120 items to choose from, the Business Lunch Buffet @ SKY 360⁰ is a celebration of flavours and offers a great alternative to the lunchtime routine. Located at the rooftop of e-City Hotel at OneCity, the hotel’s SKY 360⁰ takes dining to greater heights with a stunning view of the Southern Klang Valley. You can look forward to a wide selection of antipasto, assorted cold cuts, the Caesar Salad Station and other scrumptious salads such as Grilled Chicken with Thai Mango Salad, Tiger Prawn Salad with Sweet Pickle, Red Cabbage and Apple, and Norwegian Smoked Salmon Salad with Dill Cream and Caviar. 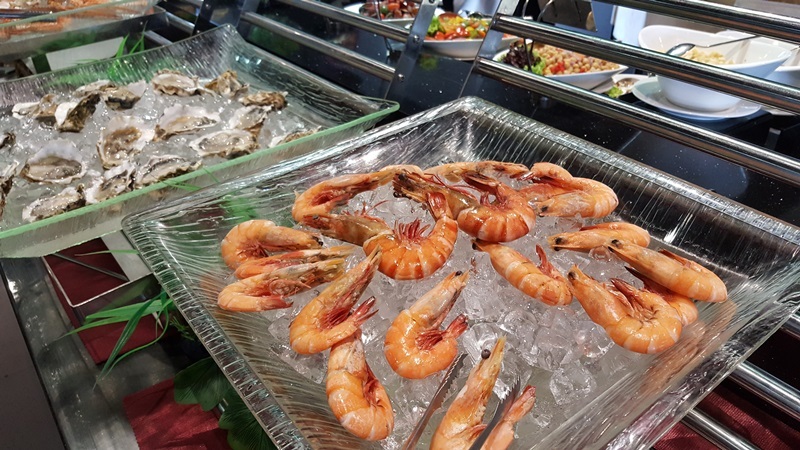 The soup station serves Chicken Goulash Soup as well as Tom Yam Soup and the Seafood Bar offers Tiger Prawns, Mussels and Crabs. Bread lovers will be pleased to find freshly baked bread rolls and bread such as Dried Fruit Bread, Walnut Bread, Seven Grain, Sunflower Baguette, Cumin Bread, Curry Leaf Bread, Garlic Bread and much more. For those who prefer a more local flavour, the Kerabu Mangga Udang and Kerabu Daging will not disappoint. Of course, there is also jeruk, traditional ulam and crackers to pick on. Moving on the the main course, you will be spoilt for choice – with a Pasta Station that offers fettuccine, penne, spaghetti and fusilli with a choice of carbonara, tomato sauce and aglio olio, and a mouthwatering Western counter that serves Oven Roasted Chicken Roulade with Forest Mushroom, Root Vegetables and Baby Potatoes with Mushroom Sauce Reduction, and Oven Roasted Balsamic Glazed Vegetables with Toasted Pine Nuts. There is also a Carving Station serving Roasted Striploin Beef with Thyme Shallot Sauce and Dijon Mustard, and a Noodles Station with mouth-watering Prawn Noodles. The Chinese Dishes selection offers Fried Bee Hoon, Steamed Broccolli with Crabmeat Sauce and Wok Fried Lala with Kam Heong Sauce, whilst the Malay Dishes spread serves Nasi Minyak, Kambing Kuzi Karala and Udang Masak Lemak Nenas. 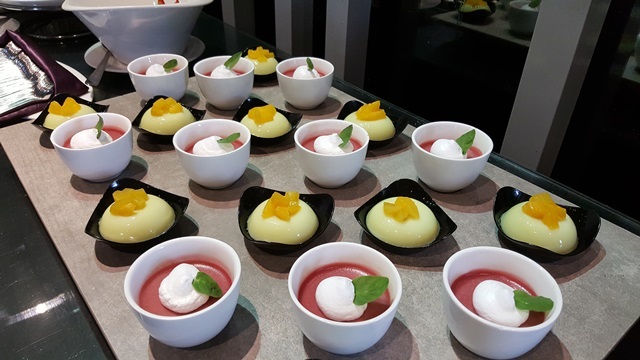 To top it all off, there is a generous selection of desserts to choose from – Malay, Western and cold desserts as well as French Pastries and an Ice Kacang counter. Indulge in Kuih Lapis Pelangi, Kuih Talam Kedah, Bubur Kacang Hijau Bersagu, Sago Gula Melaka, Honeydew Pudding, Bread and Butter Pudding with Vanilla Sauce, Chocolate Mud Cake, Pistachio Bavarian, Caramelised Pecan Tart, Almond Pear Tart, Fresh Fruit Tartlets, Cream Puff with Vanilla Cream and Mini Crème Brulee, to name a few. Whether dining with friends, family or loved ones or meeting for a business discussion, SKY 360⁰ is an ideal venue. Available on weekdays, the Lunch Buffet spread offers something for everyone – from the health conscious to those with great appetites. For more information about Business Lunch Buffet @ SKY 360⁰, plsease visit their e-City Hotel Website and Facebook Page. Looking forward to visit in Singapore this year with the kids, and we will surely try Sky 360 lunch buffet. Love that dessert table and good option to choose from this variety. OMG! The place is perfect for a romantic date. Honestly, I love to dine in on a rooftop restaurant. For me, I feel refresh and a radical energy at night when the vibe is more lounge-like and hip. Cool!